“Every one of us, we all have our own personal stories, including myself,” said Don Barraclough, whose mother committed suicide when she was in her early twenties and living in Vancouver. 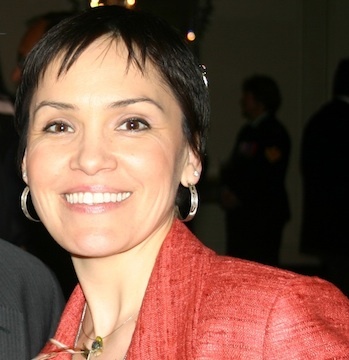 Barraclough, president and CEO of NationTalk, is from the Peguis First Nation in Manitoba. A recent series of suicides in First Nations communities sparked the idea to hold a benefit concert to bring attention to suicide concerns. The event is more about “life promotion” than it is about suicide, said Barraclough, but the awareness it draws to the issue in general will be beneficial. The Indigenous Healing Our People Everywhere (iHope) Benefit Concert is being held at the Vogue Theatre in Vancouver on Nov. 17. The line-up for the show includes such talent as Buffy Sainte-Marie, Andrea Menard, Susan Aglukark, Murray Porter, and Tsatsu Stalqayu (Coastal Wolfpack)—a traditional Salish dance group. “Now that we’re hearing what’s going on, the clusters of suicide among our youth, it’s a good time to put even more attention on prevention,” Barraclough said. Andrea Menard, singer, songwriter, actress, and speaker, will play a 40-minute set during iHope. She’s on just before Susan Aglukark. Buffy Sainte-Marie finishes the night off. Menard has struggled with serious depression on-and-off throughout life herself, so the cause is one close to her heart. “When I found out what we were gathered for… Then it became purpose driven. It became part of my heart and soul,” said Menard, adding she believes healing work is part of her duty as an artist. Menard hopes iHope will be part of a positive shift in the way we view suicide, and the way we bring about the solution to the issue. And she’s keeping with her newest, self-imposed, mandate of being more positive herself, both with her songs, and in her personal life, by participating in it. “Joy is our natural inheritance… that is our sacred right as children of the Creator. And we just have to get back to that remembrance,” she said. Barraclough had brought together a group of healthcare workers first to talk about holding the concert, initially planning only to have a small one-guitar, one-singer type show. But the project quickly escalated the more organizers and artists became involved. Sponsors now include NationTalk, as well the Canadian Foundation for Healthcare Improvement, and the First Nations Health Managers Association. There will be a short reception before the concert, hosted by journalist Carla Robinson to honor the artists and sponsors. The main beneficiary of the concert will be the Buffalo Riders Training program. The program is run through the Thunderbird Partnership Foundation of Ontario. Nora Bressette teaches the program, and according to her, the program right now is only for adult First Nations wellness workers, like school support staff, youth program coordinators, and addictions counsellors. After the concert, however—and after the total incoming benefit funds are calculated—the program will be overhauled to meet the needs of youth, specifically between the ages of 11 and 13 in First Nations communities across Canada. “The Buffalo Rider training program basically became part of iHope because there was a First Nations youth gathering with the Assembly of First Nations Youth Council, and they were looking for a tangible way to help, and to manage… the crisis around suicide,” said Bressette. “Buffalo Rider is a good fit because ‘culture’ is the foundation,” she said. The program uses the latest research material in conjunction with culturally-specific teachings. For Bressette, the cultural component is the key ingredient. Communities that have strong cultural connections often have the lowest rate of suicide. The new, revised program should roll out in early 2017, she says, and it will be specifically taught to community-designated youth leaders who can then share their knowledge with their peers. “I really want to thank people across Canada who are going to be making donations. I’m thankful and I appreciate it… By people promoting and participating in the concert, it’s going to show youth across Canada that these individuals are cared about,” said Bressette.